Royal Delft D1653 Blue Collar Bottles is a series of 3 bowls, each of them with own design and beautiful Delft blue decoration, but all with ribs and the same decoration style. The sizes range from No.2 (21 cm Ø) to No.3 (37 cm Ø), with No.1 in between (21 cm Ø). 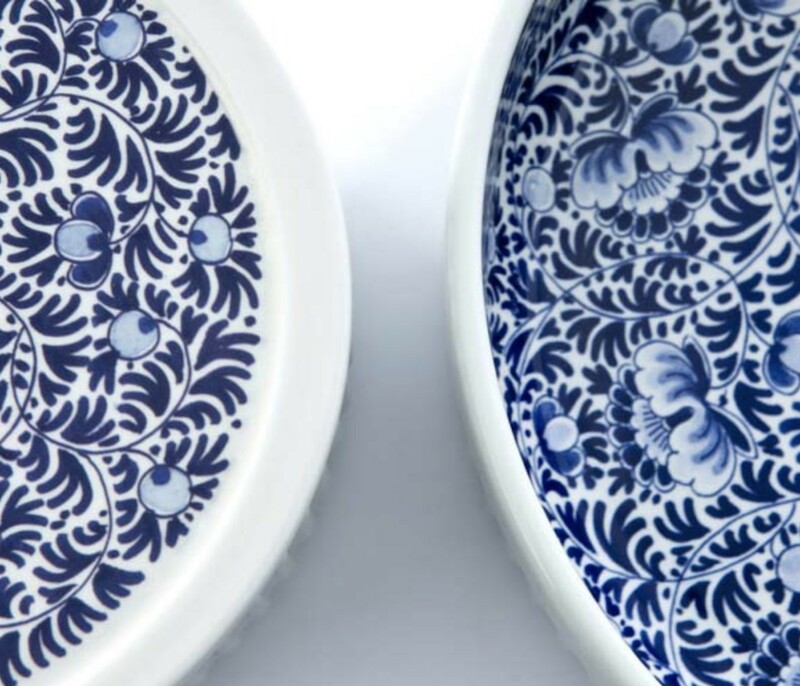 Beautiful Delft blue bowls that can be used as an ornamental object or as a utensil. 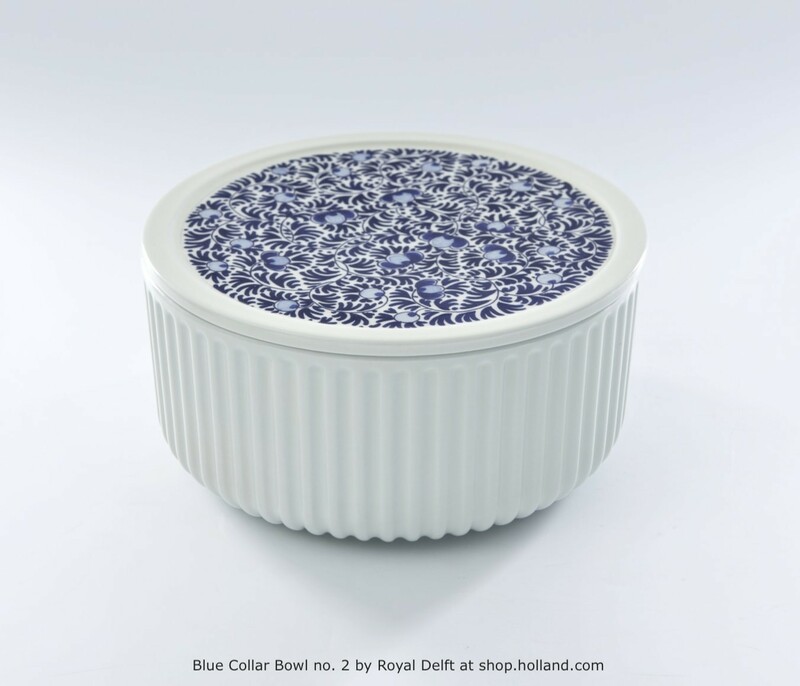 These Blue Collar Bowls is designed by Arian Brekveld who has made a perfect blend of Delft blue tradition and contemporary design. 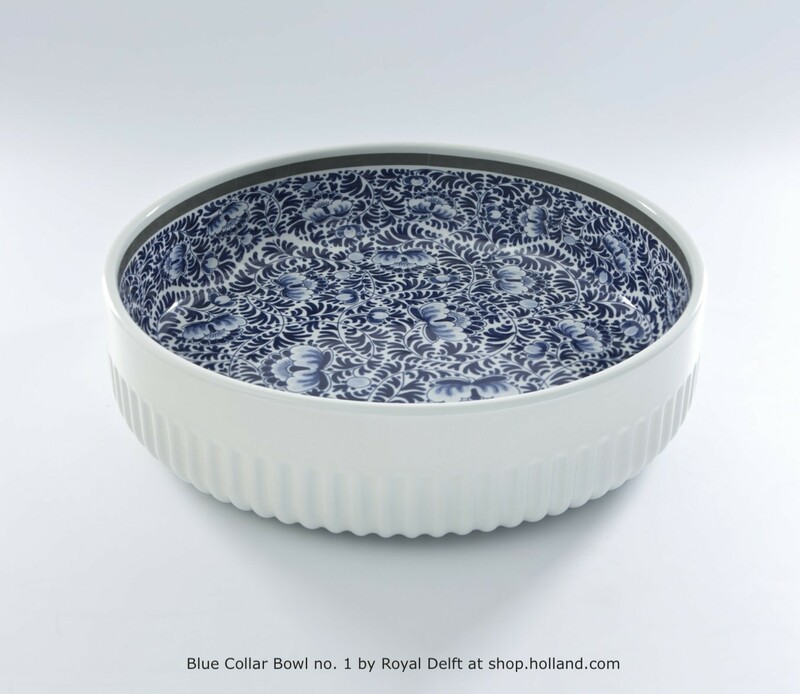 Where is a Delft Blue Collar bowl going to shine in your interior? 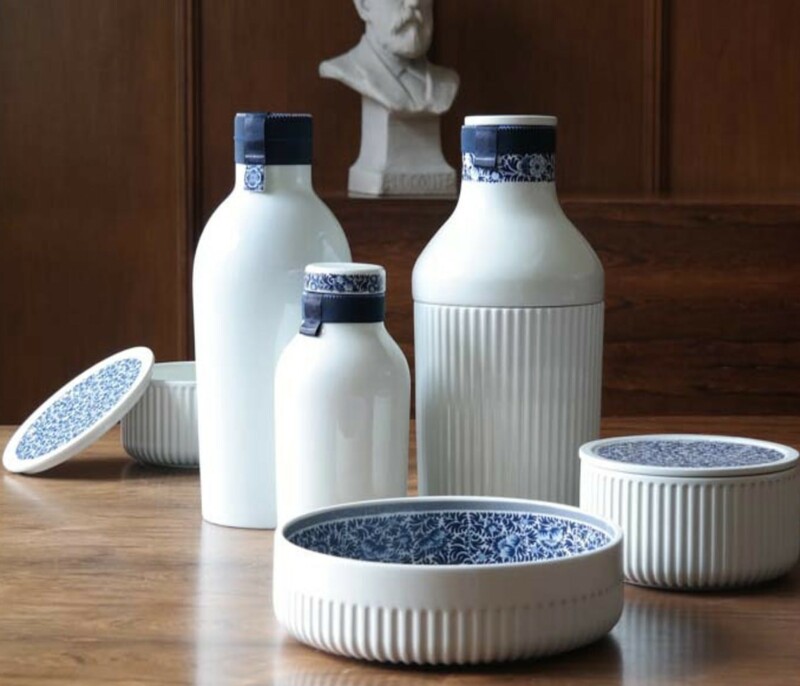 The Royal Delft D1653 collection contains 6 Blue Collar items, 3 bowls and 3 bottles, all designed by Dutch designer Arian Brekveld. Apart from their practical use, the Blue Collar items are a feast for the eyes. 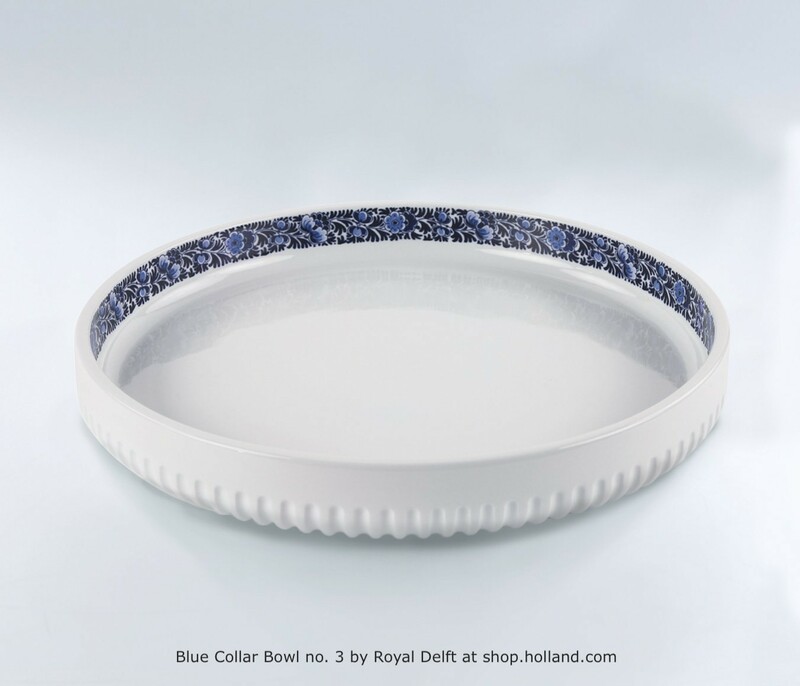 Blue Collar Bowl No.1 (30 cm Ø) is an open bowl with a ribbed outside and beautiful Delft blue decoration on the inside, where Blue Collar Bowl No.2 (21 cm Ø) has ribs and a lid with Delft blue decorations in the same style. The largest bowl is Blue Collar Bowl No.3 with a diameter of 37 cm, a ribbed body and Delft blue motives on the inside edge Since the ribs on the bowls go all the way through to the lower end, the bowls seem to float a bit The Blue Collar bowls can be used to present cookies snacks, as and fruit bowl but also as decorative object on table or closet. This series of Blue Collar Bowls and Bottles is inspired by the closet-couples from the 17th and 18th-century Dutch history. In this Golden Age, the tradition arose in the Netherlands to decorate cabinet and fireplace mantle with design, like pots, bowls, vases or bottles as a sign of wealth and good taste. These Blue Collar Bottles are produced in the in de Royal Delft factory ‘De Porceleyne Fles’ in Delft. This factory dates back to 1653 and is the only remaining and still working 17th century Delft pottery factory, where Delft blue pottery is still hand painted. Do the Royal Delft Experience, meet the passionate painters, check out the Delft Blue museum and stroll through the factory where craftsmen produce plates, vases, bowls and more. For more Delft pottery, jewellery and personal accessories see the section Delft blue in the souvenir & gift assortment of our online store.